"My Samsung Galaxy S9 accidentally fell to the ground and the Samsung screen is broken. So I can not unlock my Samsung and connect to computer with USB cable, neither. But it can still ring when a call comes in and the other features besides the screen still works normally. In this case, how can I export GIF photos from Samsung phone? Any suggestion? Thanks!" It is quite right that you can easily transfer GIF images from Samsung to computer using USB cable if your Samsung screen works well. But since the Samsung screen doesn't perform properly and react normally with your touch gestures, it is not easy to restore the GIF photos from broken Samsung phone. So is it still possible to get back the GIF from broken Samsung phone? Fortunately, there is a safe and quick way for you to recover GIF from broken Samsung phone, that is, using the professional recovery tool - Broken Android Data Extraction. It is good at recovering data from broken Android device and save the recovered files in original, non-damaged and unmodified form. Except for GIF images, it can also restore contacts, messages, call history, WhatsApp data, photos, videos, audios, documents and etc. from Samsung Galaxy S9+/S9/S8+/S8/S7/S6/S5/S4, Samsung Galaxy Note 8/Note 7/Note 6/Note 5/Note 4, Samsung J3/J3 Pro, Samsung Galaxy A9/A8/A7/A5 and etc. 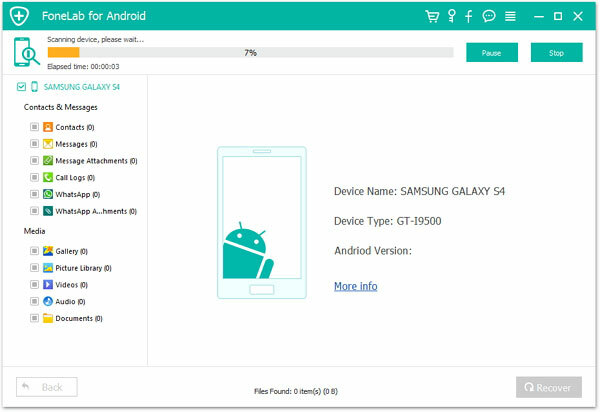 Below are the free trails of the Broken Android Data Extraction in Windows and Mac version, please download the right version on your computer and start to retrieve GIF from damaged Samsung device. Tips: In order to keep your data safe, it is quite important to backup your Samsung data regularly so that you can easily extract the backup files and get GIF back from your backup files instead of your broken Samsung phone. But if you don't have a backup file for the GIF files from your Samsung, you can still get them back with the recovery tool. With this Broken Android Data Extraction, it can automatically detect and scan your device while connecting your device to computer using USB cable without enabling USB debugging manually. So please don't worry about your screen, just follow the steps as below to get backup GIF from your Samsung phone. Step 1. 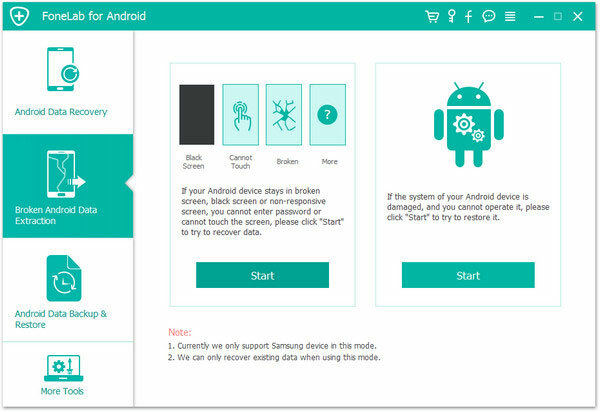 Run the Broken Android Data Extraction program on your computer after downloading and installing, connect your broken Samsung phone to computer with a USB cable. Then you will see your device is automatically detected and connected by the program right away. Step 2. Hit "Broken Android Phone Data Extraction" tab on the left panel and click the first "Start" button. 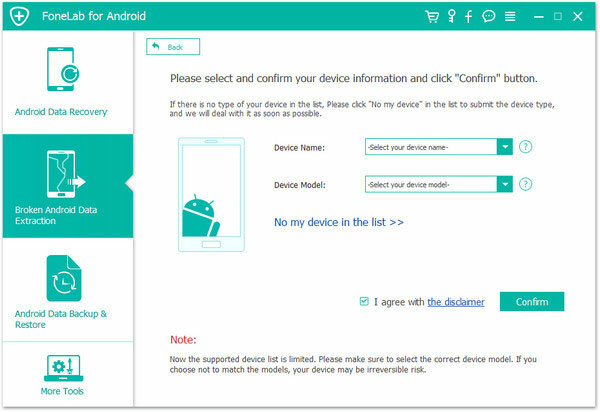 Then select your phone's name and model and hit "Confirm" option. Step 3. 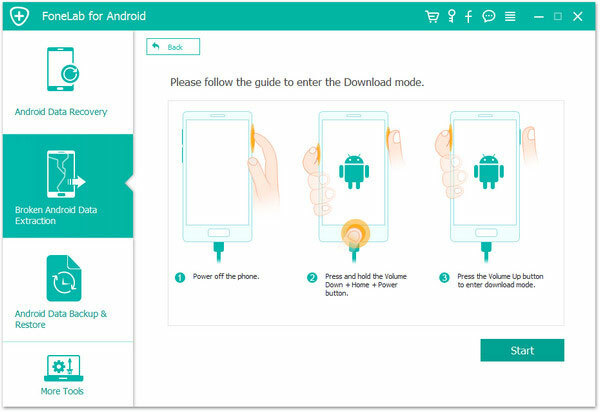 Then you might make your Samsung phone enter Download Mode with the screen instruction. After that, simply hit "Start" button to move on. Step 4. Then the program will automatically scan your phone data. Simply click "Gallery" or "Picture Library" to preview and select the desired GIF pictures and click "Recover" button to save them on your computer.